Linge Sale is no larger than its two performers, Alice Roma and Damiano Fumagalli. It's avowedly and deliberately small – stripped of artifice by its own relaxed easiness. The idea of character or performance will sometimes emerge, yet soon collapses back into the strong onstage relationship of two people who seem, simply, happy to be there. As the audience walk in, a bicycle, the one piece of apparatus for the show, is resting on its frame, back wheel spinning like the wheel on a loom and casting a diffusive shadow on the back wall. After a false start in which Roma comes in dressed up with handbag and sunglasses, playing the fashionable socialite until she cracks up and drops the act (like: enough of that), she and Fumagalli mount the bike for a played-down, naturalistic sequence that expresses the pleasure they find in their art and their own company. 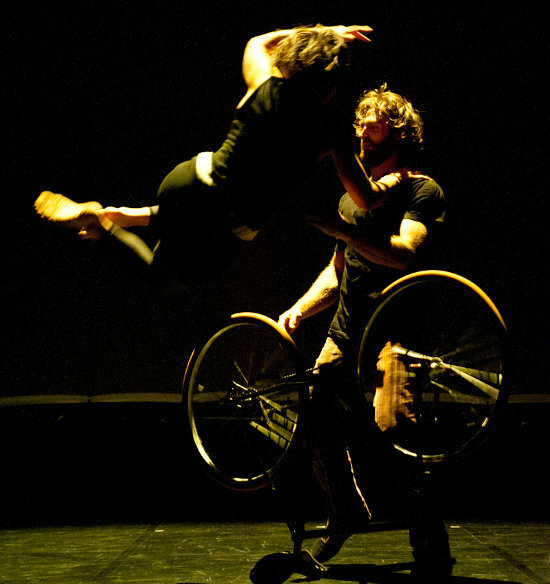 As they circle the stage and climb over each other and the bike they speak in Italian, constantly, outwards rather than to one another, over one another rather than in dialogue, and it's one of the hallmarks of the piece's director, Firenza Guidi, to work with the textural quality of language in this way, creating these warm, comfortable washes that carry no sharp literalities, communicating instead a sense of the domestic and close-to-heart. In a later scene there's an English voiceover from Roma that loops through the magical characteristics that first drew her to her partner (he was tall, mostly), but the rest of the time the performers speak principally in Italian — and it's no detriment. Language here is tone, inflection, rhythm, context; emotion abstracted from the detail of its cause. Dirty Laundry is, in fact, sort of a mood piece. The dominant mood is happiness, but it dives as well into jealousy and irritation and dependency, the canvas at the back of the (unadorned) stage changing colour – now orange, now green, now unlit and crossed diagonally with the looming shadow of the upturned bike. It is best, perhaps, at minor moods, minor keys: Rasoterra means 'ground-level' but also something like 'gliding' or 'skimming' — off the ground but low to the ground, flying with momentum — and the show is at its strongest when it's ostensibly making the least effort. There's a dramatic sequence, the back canvas lit blue-black like a new night sky, where Roma and Fumagalli run into collision-embraces (accompanied by a quite striking and cool combination of sawing metallic resonance noises + short frantic accordion + industrial percussion), throwing themselves at one another in a choreography that was perfectly sensible as an interpretation of their stage relationship, yet felt to me too typical and unaware in its starkness and extremity — especially in the context of a show that is otherwise confident enough to work with lighter touches. At the opposite end of the spectrum, the piece tips a little too far toward manufactured joy in a final scene where the two cycle round delivering what I think we can now call the Firenza Yes – an affirmative, circling litany of yessing that came off forced enough that a couple audience members laughed at it (not unkindly, and only because the rest of the show is so unforced). A couple of snags then, but the rest of the time? It's tuneful rather then lyrical; sunny and likeable and small. It sometimes felt to me like it was happening outdoors: expansive and spacious, glad to be out in it.